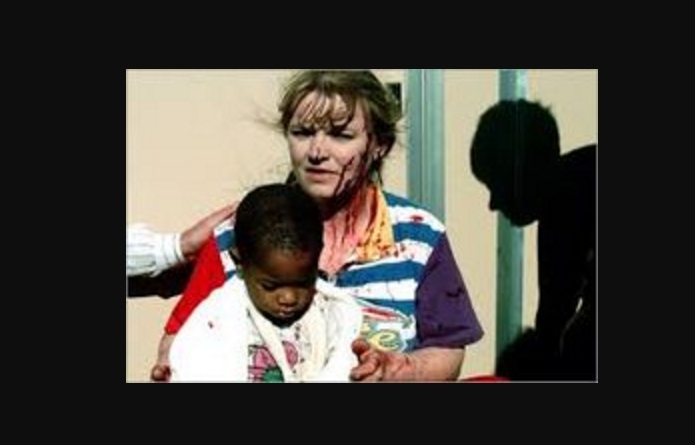 Today I just thought I'd spend a few minutes looking at the old (1995), infamous "OKLAHOMA CITY BOMBING". I must admit that I've never spent any serious amount of time looking into that old "event" (a probable prequel of the Grand 9/11 Hoax). It clearly shows a woman (dressed in white-blue striped shirt) with a head bandage. 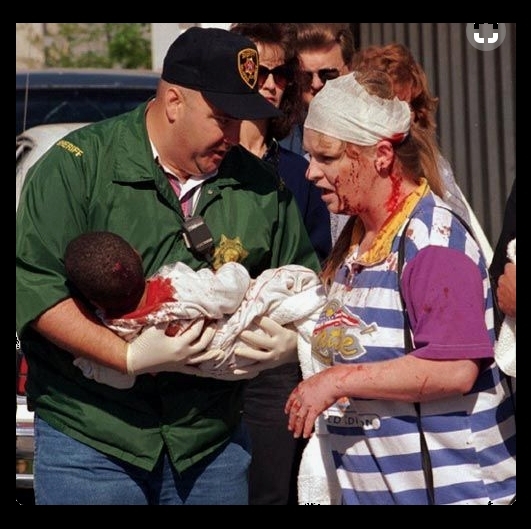 A sheriff is seemingly handing her a black, wounded child. Now, I'm asking you - dear intelligent readers : does ANY aspect of these two "photographs" make ANY logical sense? If not, is it not HIGH TIME for everyone in this world to understand that NO purported "photographic" material diffused by the news media is trustworthy? And that, in order to protect our children from this inane, fake "TV TERROR", everyone must throw out their TV sets IMMEDIATELY from their homes - and instruct their children to avoid reading or watching ANY of the "information" diffused by the criminally / militarily / governmentally corrupt mainstream news media ? Wow, good find, Simon. They look like two totally different women too! I suppose it was a mistake that these inconsistent "practice" shots were released. I actually spent a fair amount of time researching the OKC bombing, and it was very much like 9/11 with the same type of cheesy victim stories. I wish I would have taken the time to document some of my findings, but it was before this forum was established, and I wasn't blogging yet. Those white and blue stripes appear in those simulated tewowist attacks 99% of the time.